Comfort foods are meant to comfort; simply because they are hearty and packed with goodness. There are two kinds of ‘goodness’ though. One’s a wholesome heart-healthy goodness and the other – an immediate goodness that only lasts for as long as your tongue touches and your teeth bites into it. You know what I mean, the part where gluttony sets in, when you crave for that taste and couldn’t care less about the fat and hmmm transfat? I won’t try to blacklist any foods here. Hee..
We all know that the tastiest things are usually not good for us and likewise, healthy stuff taste like grass. But hey, it doesn’t always have to be that way. In my opinion, a balance can be obtained and I’ve come to a conclusion that healthy foods can really taste as good; if not better than normal artery clogging chow. Honestly, I’m very sceptical about anything labeled low-fat because to me, it just acts as a red alarm, telling me that there’s going to be a whole lot of sugar in it, to make up for the ‘less fat’? Heh, well it’s just what I’ve noticed. 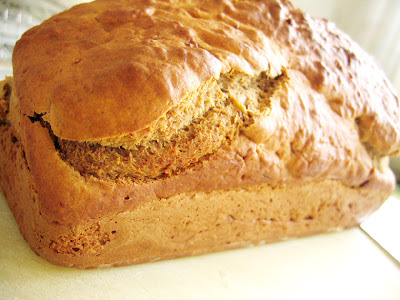 Okay, speaking of which, here’s a great and easy bread you can try baking for starters. 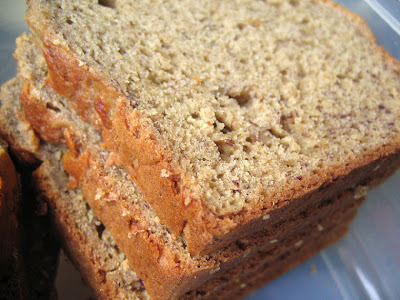 Banana bread is one of my choice comfort foods. Nothing beats the sweet banana aftertaste that comes with each bite. There’s a wholesome mornin’ breakfast feel to it. Tastes great with coffee or tea and ohhh… it’s even yummier when toasted. 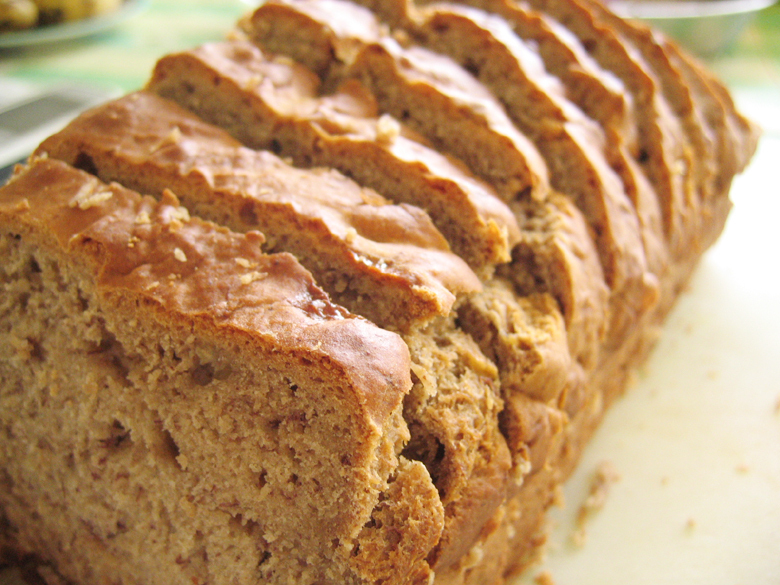 I’ve tried baking banana bread but none has been as successful as this one – in terms of taste and form. 1. Preheat the oven to 170 degree celcius. Lightly grease a 22cm x 12cm (9 inch x 5 inch) loaf tin and line the base with baking paper. Heat the coffee in a small saucepan over low heat, add the soft brown sugar and stir until the sugar has dissolved. 2. Place the egg, egg white, oil and vanilla essence in a bowl and heat together until just combined. Add the sweetened strong coffee and the mashed banana. 3. Sift the plain and self-raising flours, baking powder, ginger, nutmeg, cinnamon and bicarbonate of soda onto th emixture and stir gently to combine – do not overbeat. Spoon the mixture into the prepared loaf tin. 4. Bake for 50 minutes, or until a skewer comes out clean when inserted into the centre. Leave in the tin for 10 minutes before turning out onto a wire rack to cool completely. Note: Banana bread is delicious when served toasted. just wondering, how much nutmeg powder goes into the recipe? and and where may i find ground ginger? Strong coffee and bananas? My two favourite ingredients. I have to try this. Thank you for the recipe! hey! the bread certainly looks yummy! is this like banana cake? Your banana bread looks scrumptious! making me hungry at 2am in the morning! sounds like a simple enough recipe, will def try it. but do u mean heat the oil and eggs or Beat the oil and eggs? i mean wont the eggs be scrambled? 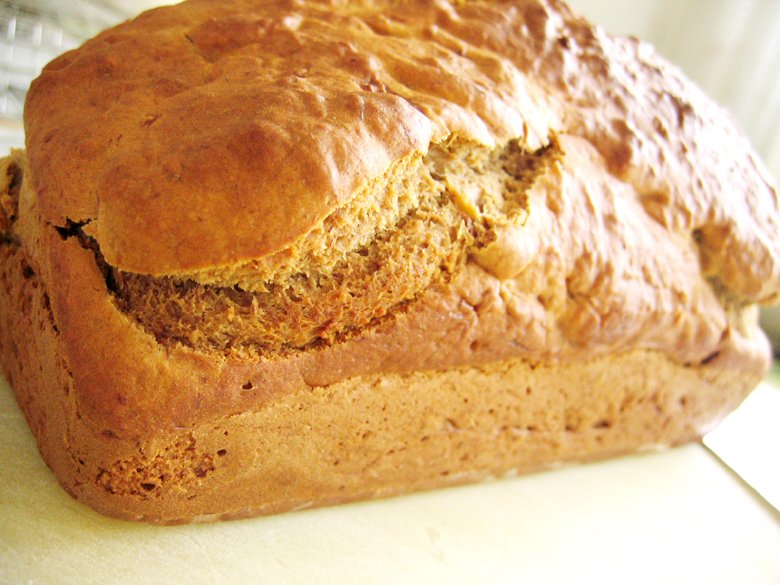 i made this bread this morning and it is delicious! wonderful light texture, i will definitely be making it again! thank you!